While the United States is home to many invasive species, native creatures still inhabit their original landscapes, and the Northeast is no exception. The different habitats of the Northeast include wetlands, thick forests, meadows and coastal areas, which provide the diversity needed for the different species of mammals, reptiles, amphibians and others. The Northeast is home to a couple of large, hoofed animals in the deer family: moose and white-tailed deer. 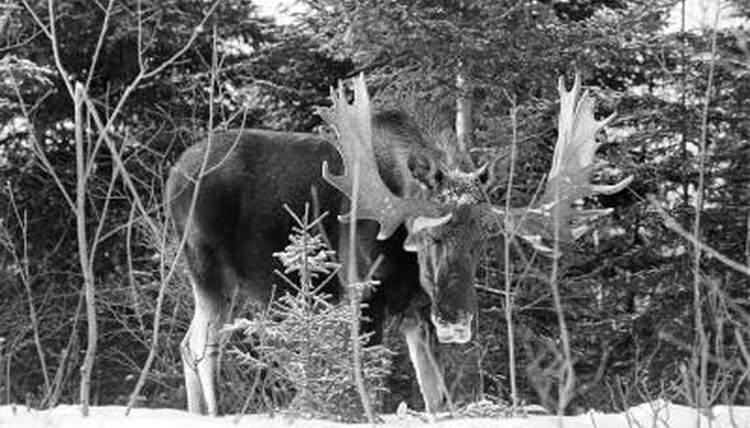 The moose is the largest member of the deer family, and the subspecies living in the northeast, the eastern moose (Alces alces americana) can reach almost 1 ton, although around 1,000 pounds is more common. Males also have the largest antlers, sometimes reaching well over 5 feet wide. White-tailed deer are also common throughout the Northeast. Adult bucks in Maine can reach almost 400 pounds, although 200 to 300 pounds is more common. These deer have the characteristic white flag tail, sticking it straight up as they run to display the white fur on the underside. The Northeast is home to a couple of large, predatory mammals. Although Canada lynx (Lynx canadensis) were once common throughout many areas of the United States, they now have limited U.S. populations; Maine is the only Northeast state they call home. Bobcats (Felis rufus) also live in the Northeast. Coyotes (Canis latrans) are extremely adaptable and live in nearly any habitat with a food source. Smaller canines are also present: gray (Urocyon cinereoargenteus) and red foxes (Vulpes vulpes). The largest native predatory mammal of the Northeast is the black bear (Ursus americanus), reaching up to 600 pounds. The black bear is the only species of bear inhabiting the eastern U.S.
On the smaller end of the mammal group are the rodents, and there is no shortage of these diverse creatures throughout the Northeast. Rodents include moles, rats, shrews and many species of squirrels, including both the northern (Glaucomys sabrinus) and southern flying squirrels (Glaucomys volans). This portion of the U.S. is also home to moderately sized mammals, such as the raccoon (Procyon lotor), opossum (Didelphis marsupialis) and several types of bat. The various habitats in Northeast prove beneficial to the many types of reptiles and amphibians living in the state. Turtle species include terrestrial box turtles and the large snapping turtle (Chelydra serpentina). Snakes are particularly diverse in the Northeast, from water snakes to pit vipers, such as the timber rattlesnake (Crotalus horridus) and copperhead (Agkistrodon contortrix mokasen), and many others in between. Skinks, salamanders and frogs are also numerous throughout the Northeast. The shores of the Northeast are visited by several species of marine creatures including whales, sea turtles and seals. The most abundant species of seal in the Northeast U.S. Continental Shelf Large Marine Ecosystem is the harbor seal (Phoca vitulina). Other pinnipeds include harp (Pagophilus groenlandica), gray (halichoerus grypus) and hooded (Cystophora cristata) seals. Whale species include sperm (Physeter macrocepholus), Gervais beaked (mesoplodon europaeus) and beluga (Delphinapterus leucas). Dolphins frequent the waters, as well. Marine turtles include Atlantic loggerhead (Caretta caretta), Atlantic Ridley (Lepidochelys kempi) and the Atlantic leatherback (Dermochelys coriacea).